Recent headlines and discussions have pondered mixing seed from two different corn hybrids to increase yield. The idea of blending seeds from different varieties or hybrids has been around for quite some time. The theory is that two hybrids planted together in the same field might be able to produce a yield superior to what the varieties would produce on their own. This theory is based on two main ideas; first is that two hybrids may use the resources of light, fertility or water in patterns that complement each other. Another way of understanding this concept is to imagine the possibility that two plants from different hybrids are less competitive with each other than two plants from the same hybrid. The second idea and the one being advanced most recently is based on the potential to stimulate hybrid vigour in the seed of a commercial corn crop. When the pollen of hybrid A pollinates the ear of hybrid B there is the potential for this vigour to cause kernel size to be greater than if hybrid B received its own pollen. Several key studies will shed some light on the practicality of these ideas. Corn hybrid blending was examined in 1978 and 1979 in work done at the University of Guelph by Gary Hoekstra (now at Kemptville College, University of Guelph). He examined a number of different corn hybrids under different populations, while blending the hybrids in mixtures of various proportion. His experiments focused particularly on the competition effects between hybrids in trying to arrive at mixtures that would use the available resources more efficiently. The results from Hoeskstras research showed hybrid mixtures never outyielded the highest yielding hybrid used in the mixture when it was planted in a pure stand. The work that has gained the most attention on this issue lately comes from Minnesota, from Dr. Mark Westgate (currently at Iowa State University). He focused on the effects that hybrid mixing (and the resultant cross pollinating) could have on seed size and grain yield. This study compared hybrid mixing on a large number of on-farm sites in 1997. Farm co-operators were asked to set up trials comparing two hybrids planted in an every-other-row pattern. The yields obtained from this mixed planting were then compared to yields from neighbouring plots where hybrids A and B were planted in pure stands. They reported about a four-bushel average gain in yield from mixing hybrids as long as the hybrids were from different seed companies; when hybrids came from the same company there was no yield advantage to the mixture. This suggests the cross-pollinating boost to seed size or yield is greater from two hybrids that have different parentage and that this would be more likely when hybrids came from different companies. It should be pointed out, however, that all seed companies do not exclusively use their own parent material, so a grower would have no way of knowing whether the parentage of hybrid A from one company could indeed be similar (or dissimilar) to hybrid B he selected from another company. Dr. Lori Carrigan, Pioneer Hi-Bred Ltd. has suggested another of the key reasons mixtures generally dont yield more is that 50-75 per cent of the pollen that an ear receives is from its own tassel, eliminating any cross pollinating boost to seed size. This past season Dr. Lianne Dwyer of Agriculture and Agri-food Canada in Ottawa set out to compare three different sets of corn hybrid mixtures. The hybrid pairs were selected based on having similar maturities and similar yield potentials. Unlike the work in Minnesota these hybrids were physically mixed together in equal portions before being placed into the planter unit hopper. One would have expected this sort of mixing to increase the percentage of cross-pollinating between hybrids that occurred relative to an alternate row mixture. 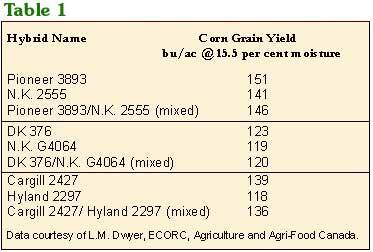 Table 1 outlines the corn hybrids and yield results from this study and illustrates that the hybrid mixtures always produced a yield somewhere intermediate to the low and high yields obtained from planting the two hybrids in pure stands. Again there was no evidence to suggest that the mixture could outyield the best hybrid when planted by itself. The evidence to support hybrid mixing as a practical approach to increasing corn yields is thin. The biggest negative is that it would take a fair bit of time and work to finally arrive at the two hybrids that would combine to consistently produce a yield advantage. The day you arrive at that mixture is the day five new hybrids appear on the scene with yield potential or quality traits that surpass anything in your mix.